Well you all know I love to bag a thrifting bargain, so I had to show you my cheapest purchase to date. I've been wanting a jersey wrap dress for ages, so when I spotted this one by New Look in my local Sue Ryder charity shop a couple of weeks ago, I thought it would be ideal. Here I'm wearing it with my 'Virgin Vie' costume jewellery necklace and my Alberta Ferretti sandals which were from Oxfam a good few years ago. I love the colours and pattern of this dress-turquoise is great for summer and it's what attracted me to it initially, plus the cut around the neckline is just right for me too. The reason I got my dress for 25p is that I have a 'loyalty card' with my local Sue Ryder! Its a great scheme they run, in that for every £5 you spend they stamp your card and when its full of stamps you get a free £5 spend in the shop! So the dress was £5.25, but I only had to pay 25p-this is my cheapest buy this year!! Whats been your cheapest find of the year? Great dress. I think my cheapest find this year was a pink lace dress for $5. i really like your dress. and such a bargain! not such a bargain, but i'm having memory loss and can't seem to remember the past 8 months! You look fantastic - as always, what a steal! Wow! You are always sooo Gorgeous, it's as if you just stepped out of a magazine! Hmmm, my cheapest find is still hiding somewhere! Love it! 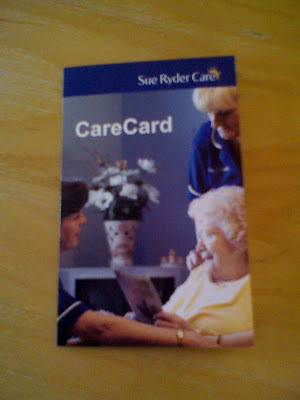 And I love the Sue Ryder loyalty card concept it is fab! Score! The dress is beautiful and suits you so well. I love the sandals too. Unfortunately, charity shops are not a big thing in Austria (yet), people take their designer stuff to second hand shops which are still expensive. 25p is definitely a record -- soon these places will be paying you instead of the other way around. The dress fits you perfectly too. What an amazing find, darling S! And it looks lovely on you! P.S. Just got some Chloe sandals at 80% off, my best deal of the summer! That is absolutely ridiculous, 25p!! I feel so extravagant with my Primarni purchases now! I scored Via Spiga shoes for $16.00! That was a super find!It looks wonderful on you. I bought a black 100% cashmere perfect little fitted jacket for $1 aussie dollar on Friday, that's one of my cheaper finds lately, and a little pair of gold leather 80s flats that same day for fifty cents. What a great find at a great price! I think the cheapest I got stuff for was around the 5 EUR mark for tops and I just paid 3 GBP for a black long-sleeved top. But I'm definitey impressed you got an entire dress for that price - and one this perfect as well! Just discovered your blog - great finds! I especially love those 50s dresses pictured on the side of your blog. You look great in them. Look forward to dropping by again. Hi everyone-thanks so much for all your lovely comments, they are very much appreciated!! cool deal. hmmm..I almost bought something for 4.99. I was going to alternate it though. It was just too long. I have been looking at dresses in thrift stores lately that would make better tops for me..since I'm short and use the bottom half to make other things with..everything from aprons to pillows. And lavender heart pillows do make great gifts. I never fail to be shocked at your bargains when I come across your page. What madness! the Sue Ryder scheme is great! 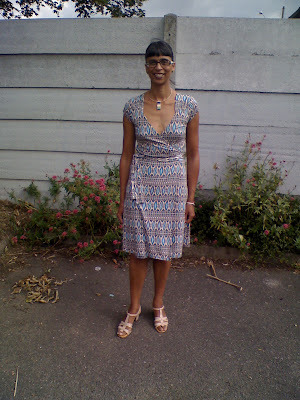 love that dress on you, the cut looks so great on you honey.the print is delish. hope you have had a good weekend. I like the pattern on that, classic and timeless! You have me beat all the way around and upside down! Nothing at that price Awesome!